I got all the pieces ironed down and to the point where I needed to now sew them down. But there I got stuck. How should I sew them down? 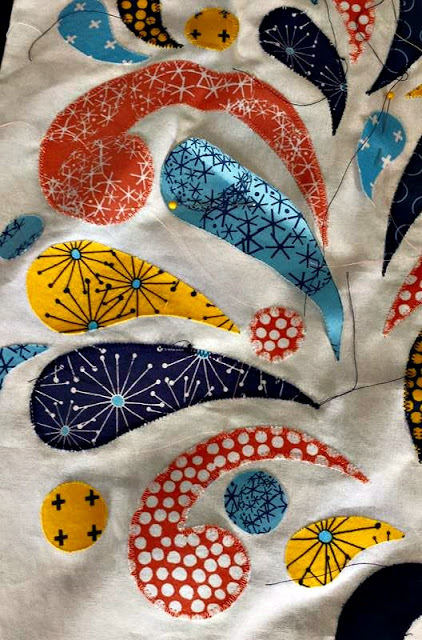 The pattern, Paisley Splash found here at Windhamfabric.com, instructs you to sew the pieces down with a zig zag stitch. But I wasn't sure that was the look I wanted. Or if I could zig zag the droplets without ruining the points. Several people I asked said they just use a straight stitch about 1/8 in from a raw edge. I like the look of that better than a zig zag but I worried about the baby quilt wearing out and pieces falling off after a few washings. And a zig zag stitch on the baby quilt, because it's really important to me that quilts for children be totally functional. I want them to be washable again and again and again. I used a fairly thin width for my zig zag, a 3.0 on my Husqvarna, tapering to a 2.5 and then a 2.0 as I got the the point. This helped preserve the sharp tip of the points. You can see I still have the yellow and the light blue to finish. And then a whole lot of threads to bury. I'm going to tuck them behind each droplet so the darker thread doesn't show through the light background fabric. You can also see a few pins holding pieces onto the background. I'm super frustrated with Heat N Bond. I had so much trouble with it in this project. Either the paper wouldn't come off or the adhesive came off with it. And once I got them all ironed on, some pieces started to lift immediately. A friend gave me a piece of Steam a Seam to try. I hope I like it better! So these are both still works in progress but I wanted to share the decision making process. I think considering each quilt's function and recipient is equally important to maintaining your vision of form or design. I agree that the decision making process for raw edge applique and how to stitch them down varies based on the quilt and use for me. 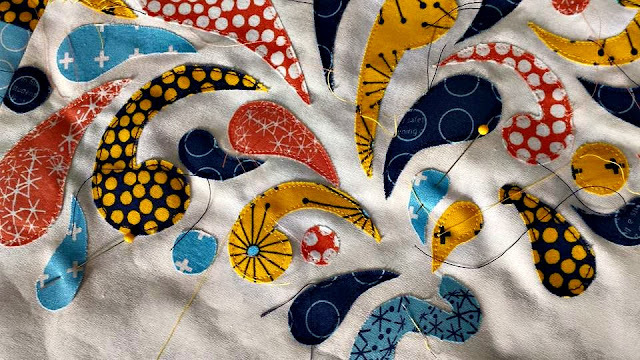 I prefer the look of the straight stitch, but will even sew around 3-4 times with a zig-zag on quilts I know will get a lot of use! 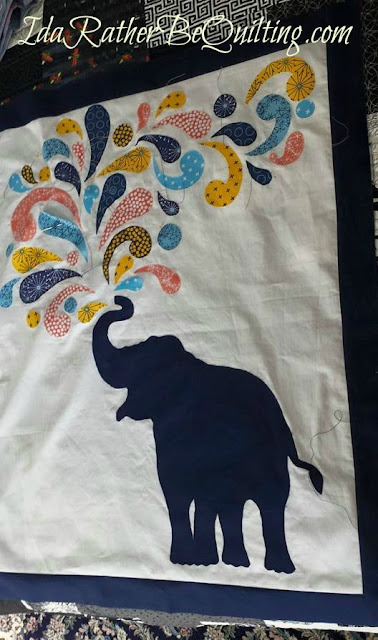 I have a fusible applique quilt I am making for my bed and I did a machine blanket stitch around each piece - looks like I did it by hand and I like that. Love this quilt of yours!! Ida! These are adorable! Did I mention that Nick and I love elephants? If you want, I can talk your ear off next time we see each other about all my Thai elephant experiences - although being very truthful, a lot of them are exploitative and heartbreaking. I love that you're going to bury your threads. I've actually never done it, but that's mostly because I've been told by so many quilters that it's not worthwhile. I can't wait to see these finished! Are you bringing them to our next no-self-criticism show and tell? thank you for sharing your thought processes on making quilts to suit their use and users. The tips on machine applique are very handy for me too! 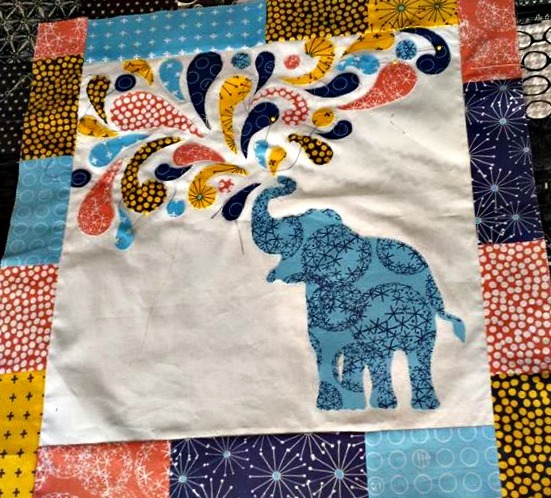 Nice to meet another member of the 2015 New Quilt Blogger's Blog Hop! I struggled with the same attachment worries you did with your appliqué. I chose a straight stitch but then I also turned my raw edge under. That would have been a humongous undertaking with all your raindrops. It is good that you had two projects and did not have to make a choice. Hmmm. Maybe you had TWO choices you had to make? Here is how I did my appliqué.